Truffles are the fruit of a mycorrhizal fungi. That means that lives associated to the roots of some host trees or shrubs, as oaks, holm oaks and hazels, Cistus or some pines. Truffles fruits into the ground and some species become aromatic with the aim that some animals dig them up the ground and while eating them spread their spores. The aroma is also appreciated by humans and recognized by dogs that can be trained to harvest them. Truffles belong to the genus Tuber, into de Ascomicotina. 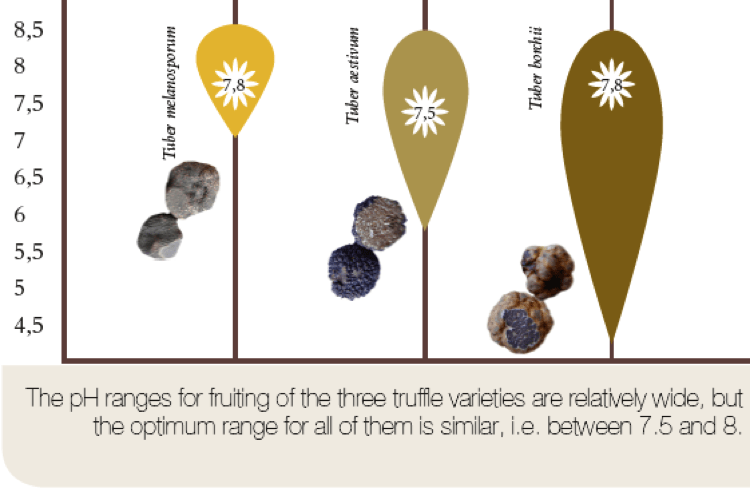 There are several species, around 40, but a few of them have a real market value, like the black truffle or Perigord truffle Tuber melanosporum, the winter truffle Tuber brumale, the summer trufle Tuber aestivum and its ecotype the bourgundy truffle Tuber uncinatum, and the white truffle from Piamonte Tuber magnatum, with great value, but its cultivation still has random results. La trufa negra se desarrolla sobre suelo calizo, en carrascales, quejigares y coscojares de la región Mediterránea de España. Éstas son mayoritarias en la mitad oriental de la Península y se encuentran sobre rocas de edad geológica encuadradas en los periodos Primario, Secundario-Mesozoico (Triásico, Jurásico, Cretácico), Terciario y aluviales del Cuaternario o recientes, con un predominio de calizas duras del Jurásico Superior. Las trufas aparecen de forma natural a altitudes entre 100 y 1500 m.s.n.m. y en exposiciones soleadas. Es conveniente elegir zonas con una ligera pendiente para evitar el encharcamiento de los terrenos llanos y los fondos de valle (a no ser que presenten un subsuelo con buen drenaje), así como la erosión de los terrenos muy inclinados, donde además será más compleja la mecanización y se favorece la desecación del suelo. Most of parameters before analyzed for truffle culture are not bearing in mind nowadays. Texture, carbonates, iron, magnesium, potassium…have great variability. 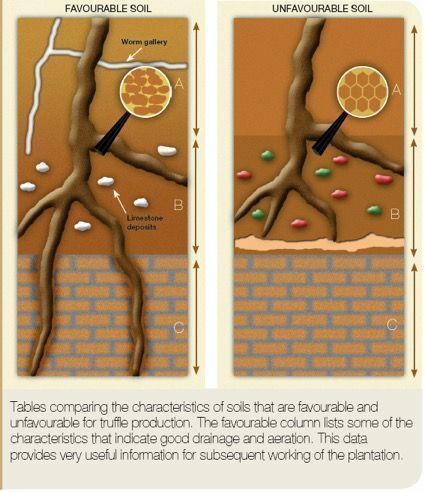 Actually the soil structure trough the study of the horizons and the biological activity are more studied. Soil should not be water Proof, allowing water and air to drain trough. To check if the soil has carbonates we can just drop diluted clorhidric acid and see that the soil boils (effervescence). Should not have discontinuities between layers, with some difficult to mark limits between them. Crumble structure and spherical particles. Avoid prismatic structures, sign of lixiviation. Laminar structures shows compactation and flood. Bad soil structures get grooved and heavy on dry weather. 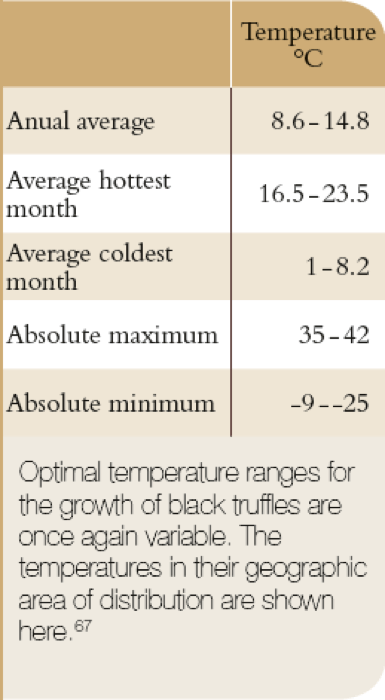 Black and summer truffle are adapted to dry and hot conditions, with well marked seasons, humid temperate or cold sub humid Mediterranean climate. Hot and humid springs, dry summers with some storms, no frost at the beginning of autumn, and winters with no long cold periods below 10ºC. Rain between 425-900 mm. (600-1500 mm in Italy and France). 48-64 mm of rain monthly from June to the end of august, from a few summer storms. Previous crops will condition the organic matter contents and fungi contaminations on the area we’re planning to plant the mycorhized seedlings. Best previous crops are cereals, pulses, lucerne, most of fruit trees, as they are endomycorhizal. 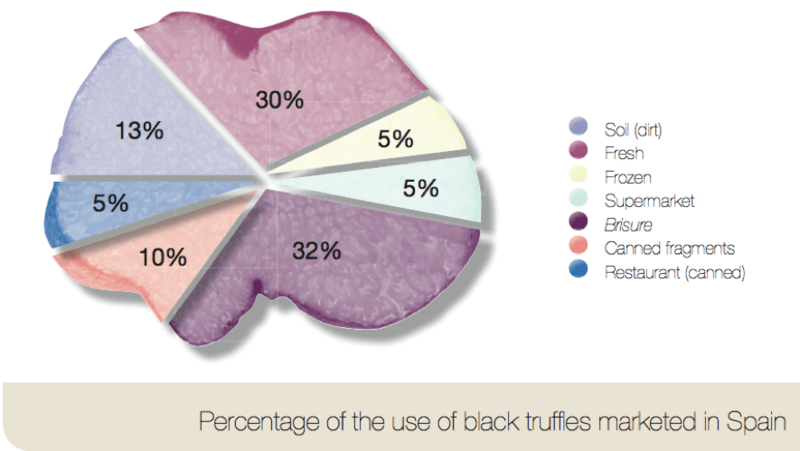 Black truffle grows in symbiosis with a wide variety of plants (see next chart). But just some of them are used for its cultivation. Actually in Spain about 90% of plantation are with holm oak (Quercus ilex ssp. ballota), and secondary oaks (Quercus pubescens, Quercus faginea)and hazel (Corylus avellana). 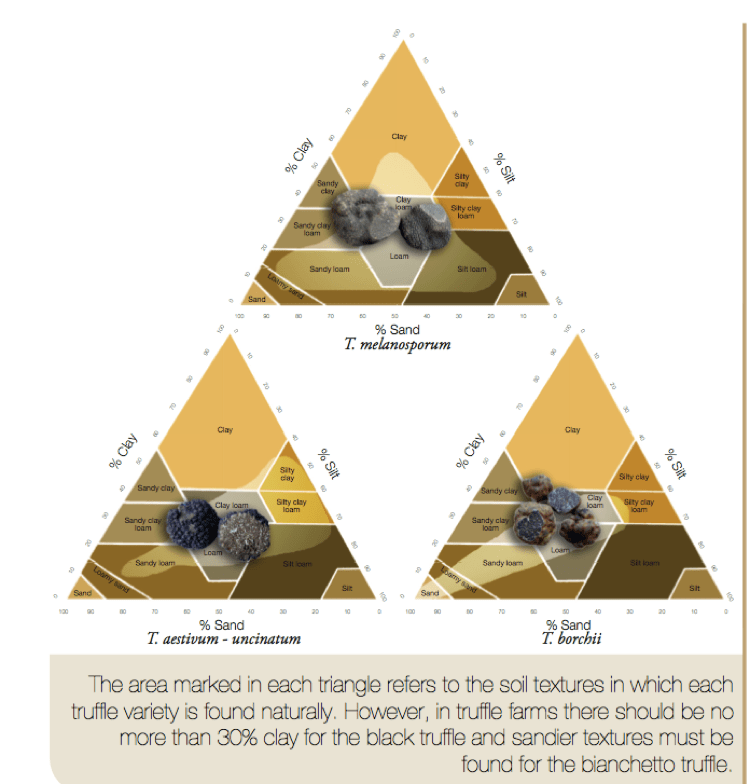 We recommend densities between 200-400 trees/Ha for the black truffle. Less density as deeper, rich soils and with water stocks, as trees will grow faster. More trees per hectare allow more trees to fruit and less time to wait for the production to start, but we have to prune more to avoid the plantation to get closed. 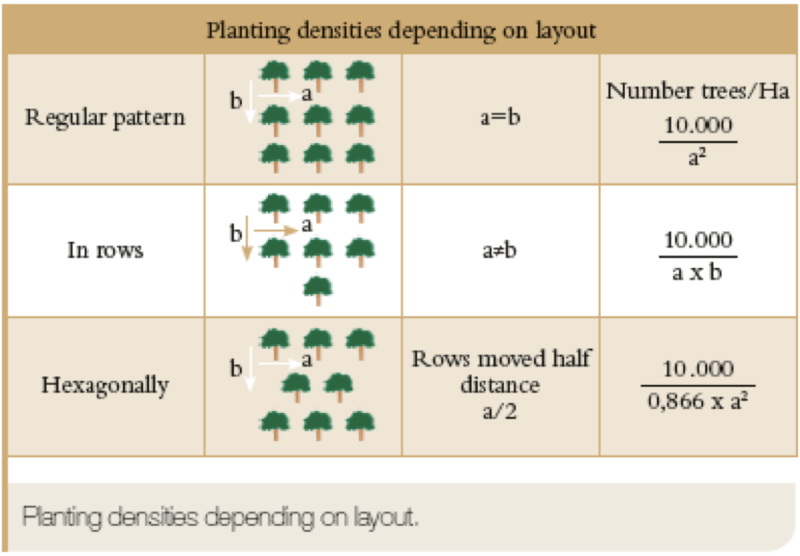 Usually plants are located at 6×6 or 7×7 but we can also join plants in the row and separate the rows at more distance (6×8, 5×7 or 4×10). In this case rows are planted north to south, allowing sun to light the centre of the whole row. Previous works to get the soil ready to plant are done in summer and autumn. Any ploughing will be done with no heavy tractors and on dry soil avoiding soil compactation. If soil is OK, but there’s no drainage we can plough deeper trying to break the plough layer that appear after several years working at the same deep. Note not to tumble and mix soil layers, that can lead to a delay starting to fruit. Between November and may dig the plant holes and mark them not to harm the small seedlings once planted, hard to see trough the weeds. 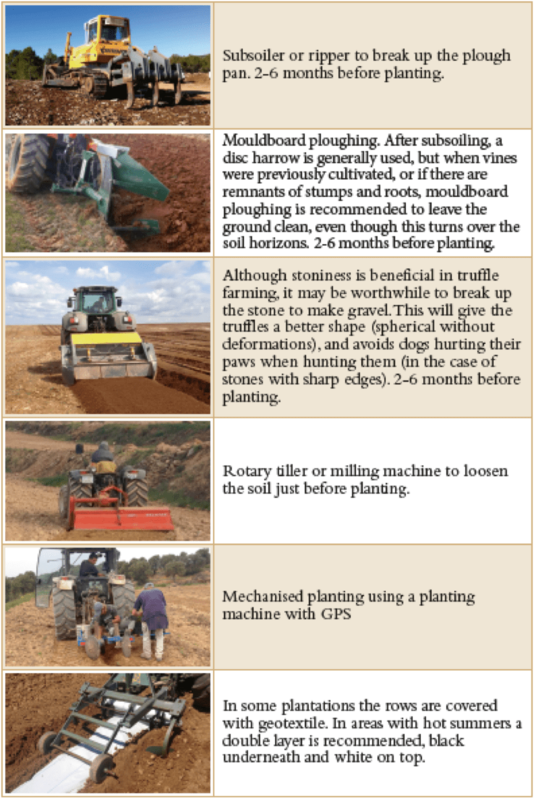 In the following figure you can see the most comon tasks and machinery used to prepare the soil for planting a truffiere. 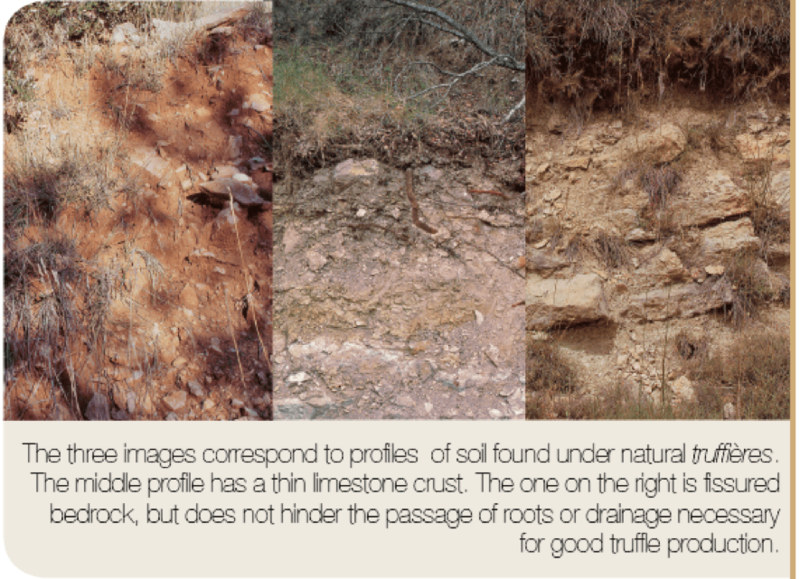 The black truffle and summer truffle growing areas have limestone soils, generally of a poor quality. These areas are used for crops associated with low agricultural performance. These farms depend on financial aid for their survival. 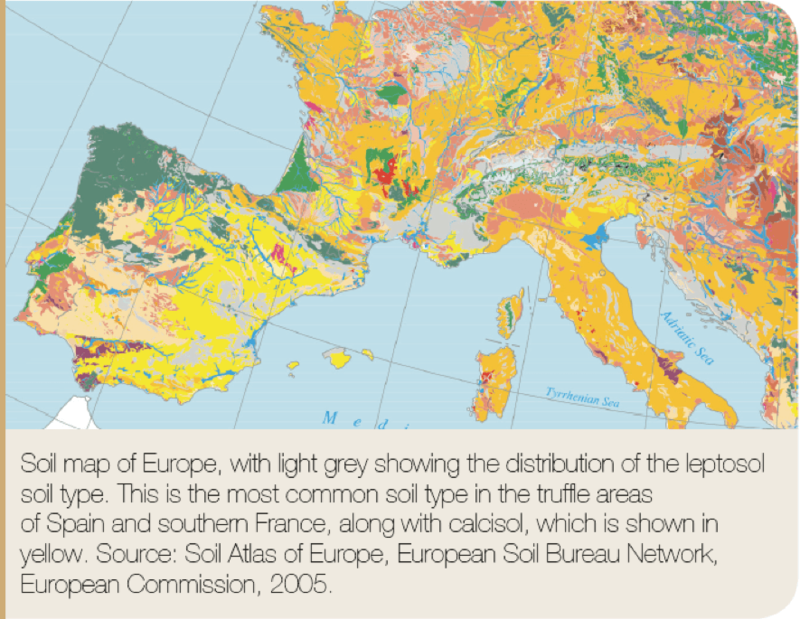 Truffle growers do not have to depend on subsidies any more, as they can triple the income earned from traditional crops in these areas, and the value of farming land may even increase in truffle growing regions. Spain, where it is estimated that some 10,000 families are involved in truffle growing and truffle gathering, accounts for 30-50% of world black truffle production. Very few people now work exclusively as truffle hunters. Most combine truffle hunting with other work and/or do it at the weekend, or try to match their holidays with the gathering season. A truffle hunter working a full day currently collects between 3-5 kg of wild black truffle a week, very far from the 8-12 kg a day remembered by old truffle hunters. The price of black truffles in Spain varies greatly depending on whether the season is good (with plenty of truffles) or not. 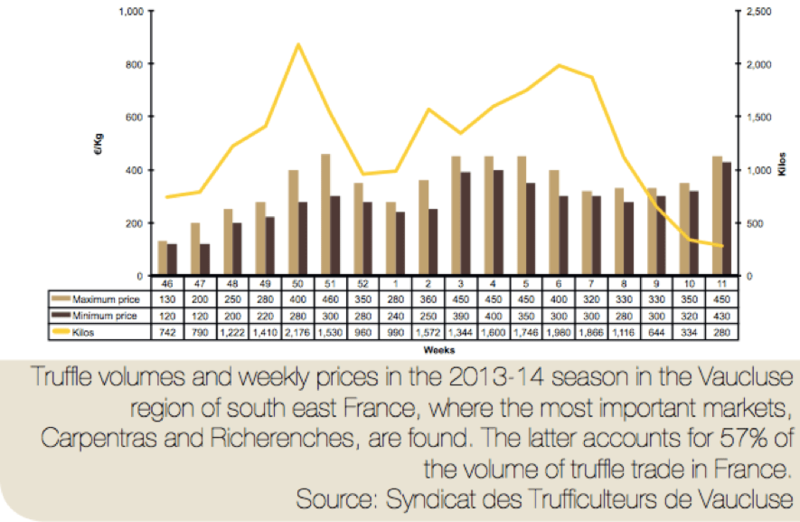 Truffle prices conform to traditional models, where higher production means lower prices. Truffle gatherers are paid between €200 and €850 per kg for the black truffle,197 and, generally, just under half this amount for winter truffles in the same season. 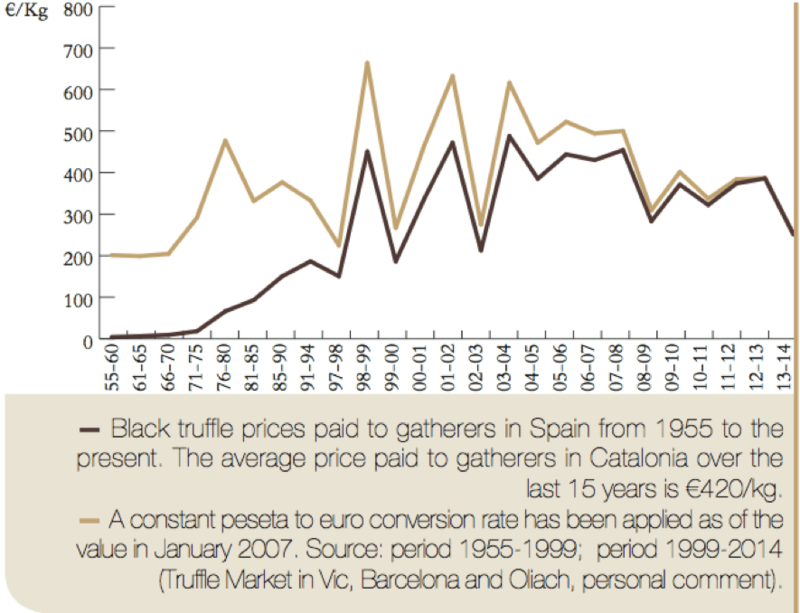 The price paid to gatherers for the summer truffle in Spain is between €35 and €80 per kg. It is hard to ascertain the average production of artificial plantations. 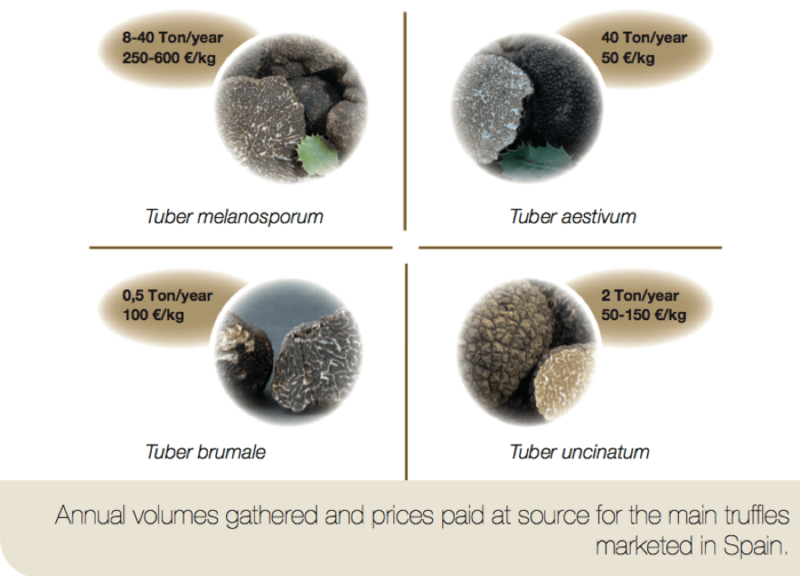 There are references to a single burn being able to produce 10 kg of truffles and to a plantation of oaks mycorrhized with black truffle producing 200 kg/ha/yr. In contrast, some plantations have never started to produce, for a variety of reasons, so truffle farming as a business is not without risk. 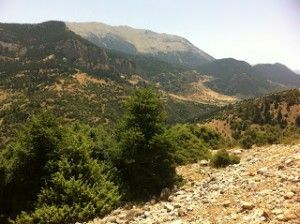 In Spain, a minimum production of 8-10 kg/ha/yr is required to recoup the investment made in a plantation. In other countries, with high initial costs, such as liming to bring up the pH, more truffles have to be produced before any profit is made, or, to put it another way, the cost of production per kilogram of truffle is greater. Some French truffle growers have remarked that production begins to decrease after 50 years. However, we have found several truffle fields over a hundred years old with burns over 12 m in diameter and in full production. 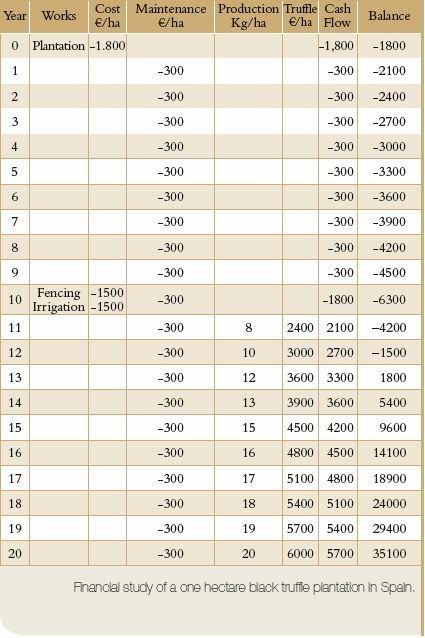 Current net values in plantations in Spain, France and Italy range from €19,424/ha to €66,972/ha. The average internal rate of return is always above 9% and the payback period of the investment is equal to or greater than 10 years.